BITS Pilani Phd Admission 2019 - Birla Institute of Technology Science (BITS) Pilani invites applications for admission to First Semester Full Time and Part Time Doctor of Philosophy (PhD) Program offered at Hyderabad, Goa and Pilani Campuses for the academic session 2019-20. 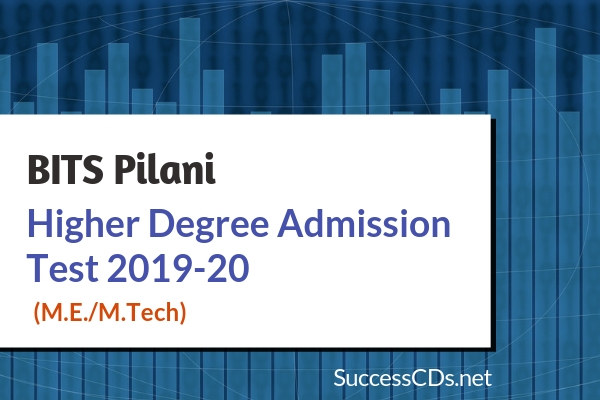 BITS Pilani is a Deemed to be University, offering on-campus programs to around 15000 students including over 11000 Doctoral students across its campuses in Pilani, Goa, Hyderabad and Dubai. BITS Pilani has been recently recognized as in "Institute of Eminence" by MHRD and is India's highest ranked non-Govt. Institute as declared in various reputed world ranking like QS BRICS, QS Asia and QS India in 2019. Candidates with an M.Sc./BE./B.Pharm or an equivalent degree with a minimum of 60% aggregate may also be considered for PhD admission subject to their suitability and competence. For PhD Program in Humanities and Social Sciences, candidates with an M.A. and with minimum of 55% aggregate may also be considered. Shortlisted candidates will be called for a written test/interview for selections. Full-time PhD students admitted into the PhD Program are eligible to be considered for an Institute fellowship of Rs. 25000/- per month in the first year. Higher assistantship will be made available in subsequent years. Consideration for fellowship will be as per Institute norms. It will be obligatory on the part of every admitted Full time student to undertake 8 to 10 hours (per week) of work as assigned to him/her by the institute. Eligible candidates should apply through the prescribed application form available online at www.bitsadmission.com and take the printout of the filled form.